The Canary Island Pine, a subtropical conifer, is one of the most striking skyline trees seen in Santa Barbara. Remarkably, it is one of the trees best suited for our Mediterranean climate. Its botanical name is Pinus canariensis. The genus, Pinus, is Latin for pines and the specific epithet, canariensis, refers to its home, the Canary Islands, an archipelago of Spain off the coast of North Africa. In its relatively small native range there, it occurs on the islands’ volcanic mountains, at 3,500 to 6,500-foot elevations, where ocean fog is common, but rain is not. It is covered with a dense foliage of blue-green needles, 8 to12 inches long, which arch gracefully downward. These needles capture moisture from the fog, where it condenses and drops to the ground to be absorbed, providing both water for the tree and ground water. The form adaptation allows this pine to survive on less than 8 inches of annual rainfall! As a result, most have done well in our dry area, in very good condition, with minimal additional irrigation. 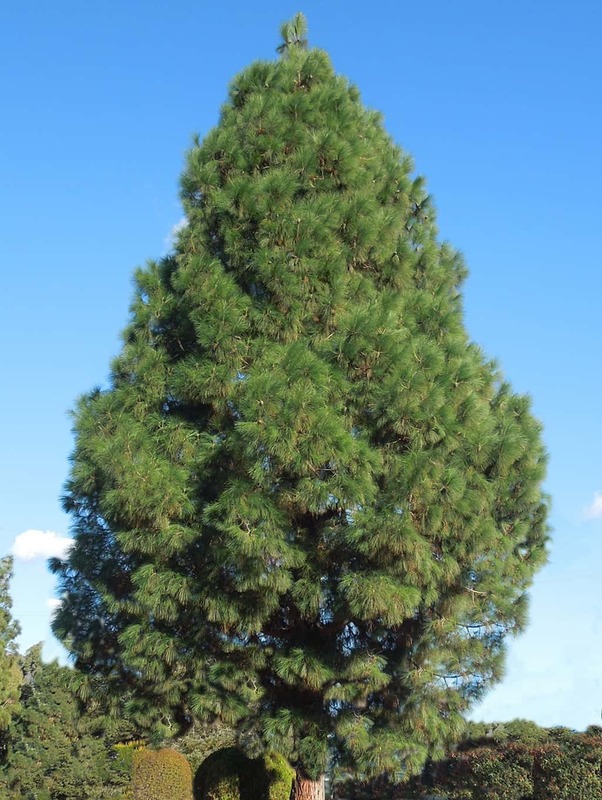 When young, the Canary Island Pine starts as a rather open and sparse-looking tree, but with its fast growth, it soon develops a slender symmetrical crown and, from a distance, looks like a perfectly shaped Christmas tree. As it matures, it develops a rounder shape, with billowy dark-green boughs. 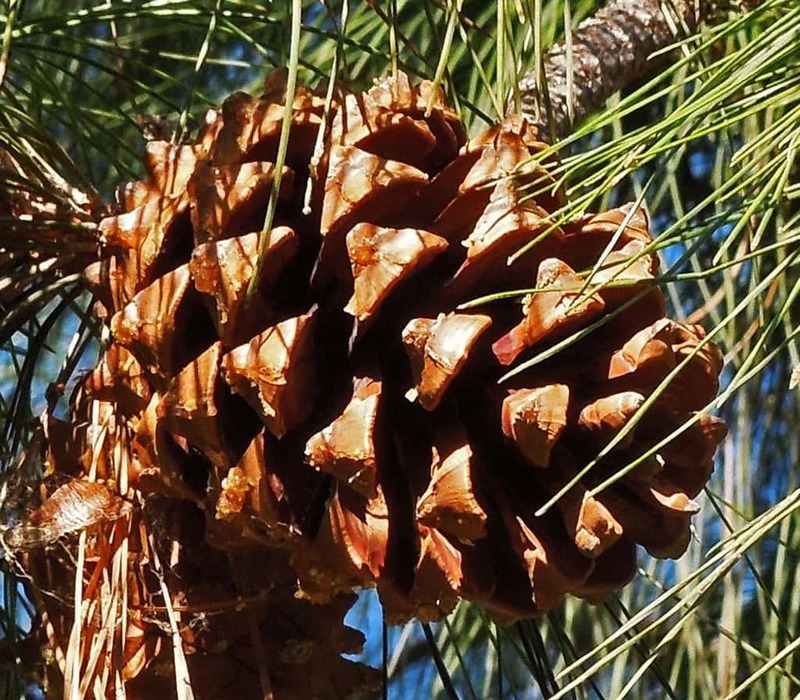 In its native habitat, it grows to be the largest of the old-world pines, 100 to 200 feet tall; however, in our climate, it normally reaches only 80 to 100 feet tall and 35 to 40 feet wide. Both male and female cones develop on the branches. The glossy chestnut-brown female cones are 5 to 7 inches long – making perfect holiday decorations. They bear unusual winged seeds, which become “flying” pine nuts that can be blown by the wind for miles. The bark is deeply fissured, forming plates of reddish-brown to orange – especially dramatic on mature trees. The wood is aromatic, hard, and durable. This lovely tree prefers well-drained, acidic soils, but can be grown well in almost all our local soil types. It does not tolerate temperatures below 15 degrees or hard frost – not generally problems here! Surprisingly for any conifer, The Canary Island Pine is considered one of the most fire-resistant trees in the world. After a fire, it will readily re-sprout foliage from epicormic shoots growing out of the lower trunk and main limbs! Its majestic shape makes it a perfect tree for open parks and large residential and commercial landscapes. As a single specimen, it shows its natural form best – when planted closer together, it also works well for a windbreak or a screen. It is commonly used as a boulevard and street tree in California. Mature specimens can be seen all round town – as park trees, in West Alameda Plaza and in MacKenzie Park (east end) – as street trees, on Los Pinos Drive, on the 3000 Block of Paseo Del Refugio, on Samarkand Drive, and on the 1000 -1100 blocks of De La Vina Street (mixed with Chir pine, Pinus roxburghii) – and, as median trees, on Upper State Street.